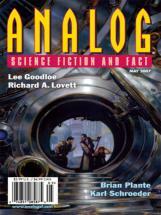 The May 2007 issue of Analog contains only four stories, but packs as much diversity of style and outlook as any I have previously reviewed for Tangent. Lee Goodloe's novella "Damned If You Do . . ." is rather more action-heavy than most of Analog's recent short fiction. The story begins with its protagonist, Chad Gutierrez, on a ski vacation in Nevada. In the course of going down a slope, he finds his way into a canyon, out of which he walks with a big piece of gold-rich jewelery rock in his hand and no idea how he or it got there—after which he shortly finds himself being chased by people who might be common thugs, but are perhaps much more. Including an astonishing amount of gun play, chases, and large explosions in a mere thirty-one pages of text, much of it reads like the script of a summer blockbuster. The action is, for the most part, standard stuff, but the sequences are fully fleshed out, lucidly written and even when a bit repetitive (there is not one but several car chases), tweaked enough to keep from being too formulaic. The interest also picks up when the object of the mystery first makes its appearance. Goodloe's lived-in future, which might be guessed to be set circa 2030 given the reference to the Depression as having been a century prior, has a few interesting touches, like its development of a methanol economy (which you don't hear very much about). Very much an action-driven story, the characterizations are thin, including Chad's. Additionally, the plotting loosens up toward the end when it should have tightened up, and the conclusion, while logically raising some interesting (if not entirely original) ideas, is a bit talky and anticlimactic, especially considering what came before. And in line with its summer movie feel, the ending leaves room open for a sequel. Nonetheless, "Damned" is, for the most part, a slick, fast, fun read. The next story, Brian Plante's "The Astronaut," represents quite the change of pace as a poignant drama about a self-described "geeky" adolescent. Davy Carson, who just moved to Seguin, Texas, in the summer before tenth grade has little to do but dream of someday being an astronaut, mow the lawn, and strike up a friendship with his beautiful, older neighbor, Rosemary Horton, whose husband's away. The speculative element is minimal: the manned Mars mission that Davy follows might easily have been adjusted to a long stay in the International Space Station, setting it in the present day. However, it being set in the future is not essential to the core, which is really Davy's relationship with Rosemary—most of it inside his head. To Plante's credit, he perfectly captures a young man's hope that a casual acquaintanceship with an attractive, seemingly unattainable woman might become something much more. The third story, by Richard A. Lovett, is "Bambi Steaks," a satire about an America divided between Red and Blue. In a future where those differences have pushed parts of the country to short-lived secessions, Americans have hit on exploiting the old standard of body-switching technology in an extreme version of Morgan Spurlock's "30 Days," institutionalizing the show's premise on a national scale as a social engineering effort. Much as with the draft, a lottery forces selected Red and Blue Staters to live a month in the bodies of their political counterparts so that, for instance, a Massachusetts liberal ends up spending thirty days as a Texan conservative, and vice-versa. The protagonist and narrator of the story is a hard-core Blue Stater who ends up inhabiting the body of Anthony, a construction worker in rural Iowa. As it happens, though, only the Blue Staters come in for such treatment. Anthony is, to put it mildly, rough around the edges (and Lovett does note that it is the reddest reds and bluest blues who seem to be picked out most by that "random" lottery), but every positive stereotype of the Red Staters is presented as true, every negative one punctured, deflated, subverted. Just as talk radio voices like Sean Hannity and Laura Ingraham would have them be, their inhabitants are politer, harder-working, and more decent than their Blue counterparts, stoic doers unlike those Blue State talkers, as well as rather more sophisticated and tolerant than the Left Coasters give them credit for. The result is that the sniveling Blue Stater, who is never in the right and just about never brings anything of value to the table, gets an education the hard way. While the politics in Analog tend to lean toward the liberal end of the spectrum (particularly where the issue of religion and science comes up, the Creationists taking a beating in several stories over the last year), this is one piece that FOX News viewers could love. However, regardless of how one identifies oneself politically, the lack of balance makes an already problematic premise more irksome—namely, the whole idea that there really are Blue and Red Americas. It is indeed the case that there are cultural and political differences between city and country, North and South, East and West, coast and heartland in the United States—just like every other nation in the world has. Nonetheless, it is exactly the kind of oversimplification of which Lovett's protagonist is often accused to turn that grain of truth into a grand unified theory of American life, and one which has had a pernicious effect on the health of American society. The divisiveness aside, it is a convenient way of ducking other, no less important issues, particularly economic ones. (For one critique of the Red and Blue America dichotomy, see Thomas Frank's bestselling What's The Matter With Kansas?) In particular, it struck me as odd that despite the narrator's low place in the service economy and alleged leftist politics, the idea that he and Anthony are both in the same social class never crossed his mind. The last story in this issue, "A Higher Level of Misunderstanding" by Carl Frederick, is about Roger, cultural liaison in the Angloterran Trade Embassy on Delva, negotiating a trade agreement with the alien Nriln. Since this comparatively brief story centers on its protagonist's solving a critical puzzle (this one to do with the seemingly inexplicable difficulty of the negotiations), to say much more would spoil it, and I enjoyed its light humor enough to not want to do that. Incidentally, those who find its key intellectual problem intriguing will likely find the issue's Science Fact article, Harry Honken's "I Couldn't Read You, E.T.," worthy of their attention.